Apple today announced financial results for the second calendar quarter and third fiscal quarter of 2012. For the quarter, Apple posted revenue of $35.0 billion and net quarterly profit of $8.8 billion, or $9.32 per diluted share, compared to revenue of $28.57 billion and net quarterly profit of $7.31 billion, or $7.79 per diluted share, in the year-ago quarter. This will be considered a big "miss" for Apple, as it is dramatically weaker than what analysts were expecting. The company did beat its own guidance, however. Last quarter, Apple said it would make $34 billion in revenue and earnings of $8.67 per share. Gross margin was 42.8 percent, compared to 41.7 percent in the year-ago quarter, and international sales accounted for 62 percent of the quarter's revenue. Apple's quarterly profit and revenue were both company records for the June quarter. Apple also declared a new quarterly dividend of $2.65 per share payable on August 16 to shareholders as of the close of trading on August 13. Quarterly iPhone unit sales reached 26.0 million, up 28 percent from the year-ago quarter, and the company sold 17.0 million iPads, up 84 percent year-over-year. Apple sold 4.0 million Macintosh computers, a unit increase of 2 percent over the year-ago quarter. The company also sold 6.8 million iPods, representing a 10 percent unit decline year-over-year. Apple's guidance for the fourth quarter of fiscal 2012 includes expected revenue of $34 billion and earnings per diluted share of $7.65. Apple will provide live streaming of its Q3 2012 financial results conference call at 2:00 PM Pacific, and MacRumors will update this story with coverage of the conference call highlights. 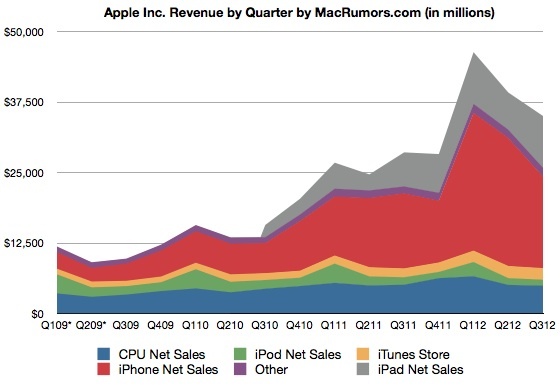 - Established new all-time quarterly records for iPad sales, and June quarter records for iPhone and Mac sales. - Year over year growth of Mac of 23%. - Strong growth in iPad and iPhone sales year over year. - Sold 4 million Macs. This represents 2% growth year over year, higher than 1% contraction of global PC market. - Customer response has been excellent for new MacBook Air and Pro models. - Best quarter ever for US education institution Mac sales. - Notable large edu sales: Rutherford County, NC -- 6k MacBook Airs. Pueblo, CO district 70 -- all high school students and K-12 staff converting to MacBook Air. - 3-4 weeks of Mac channel inventory. Below target of 4-5 weeks. - Mountain Lion comes out tomorrow. - Sold 6.8 million iPods. Versus 7.5 million last year. Ahead of Apple's internal expectations. - iPod Touch accounts for more than half of iPods sold. - Share of mp3 market is higher than 70%. Top selling mp3 player in most countries Apple tracks. - 4-6 weeks of iPod channel inventory, within targets. - $1.8 billion from iTunes Store. - Launched iTunes in 12 new countries. - Great interest in iTunes U. 14 million downloads of the app. 700 new K-12 schools and districts and 125 colleges enrolled in iTunes U. 750 new courses. - 26 million iPhones. 20.3 million last year. 28% YoY growth. Ahead of amount we factored into our guidance. - 250 carriers in over 100 countries. - Dropped 300k iPhones in channel inventory. 4-6 weeks of inventory. - Recognized revenue was $16.2 billion, versus $13.3 billion last year. Increase of 22%. - More than double the iPhones in Fortune 500 from last year. - 17 million iPads versus 9.2 million last year, up 84%. - Very strong growth in sales around the world. - Sold in 97 countries. - Up 1.2 million units in channel inventory. 4-6 weeks. - Sales setting new quarterly record for education sales. Sold 1 million iPads to education. - Sales of iPad 2 were particularly strong to K-12 market. - Achieved all-time record Mac sales to education, but sold twice as many iPads to US institutions. - Number of iPads in Fortune 500 has more than tripled in past year. - App Store in 155 countries. 650k apps, 225k for iPad. - Surpassed $5.5 billion in payments to developers. - 150 million iCloud users. - iOS 6 coming this fall. - Apple Retail: $4.1 billion in revenue, up 17% year over year. Growth coming from record iPad sales and iPhone sales. 791k Macs, half the Macs sold to customers to new Mac owners. - 9 new stores. 372 stores total. 123 stores outside US. - $11.1 million versus $10.8 million revenue per store. - 80.3 million visitors total. 17,000 visitors per store per week. - Better than expected commodity, warranty and other costs. - Offset by strong mix by iPad sales, higher mix of lower priced iPhones, and stronger US dollar. - $3.4 billion, $378 million in stock based compensation. - Tax rate of 25.6%. - Cash: $117.2 billion at end of June quarter. Up $7 billion. $81 billion in cash was offshore. - $10.2 billion cash flow from operations. - Board of directors announces dividend of $2.65 per common share. - Expect to announce record and payment dates concurrently with quarterly earnings announcements going forward. - $10 billion in stock repurchase beginning next year. - Expect revenue of $34 billion versus $28.3 billion in 2012 in September quarter. Margin of 38.5%. - Targeting EPS of $7.55 per share. - Extremely confident in our strategy. - Amazing new products in the pipeline. Q: Why is gross margin guidance so low? Been 2 years since been sub-40% gross margin. A: Down 430 basis points sequentially. Most of this decline is from fall transition, strong US dollar, full quarter of back to school promotion. Q: Seen spectacular growth in China over past several years. Macro concerns in the market and Asia-Pac growth decelerated from 100+ to 25% growth this quarter. A: Growth in Asia Pac was 25%. Vast majority in difference in sequential growth rate was the result of greater China. 2/3 of revenue in AsiaPac comes from China. 48% increase year over year. Virtually all of the $2.2 billion sequential revenue decline was due to iPhone sales in greater China. Half of that is attributable to changes in channel inventory not underlying sell-through. Launched iPhone 4S in China last quarter, added China Telecom as second carrier in March. Increased channel inventory over the quarter to meet targets. Mainly attributable to normal seasonality after very successful iPhone 4S launch. Didn't see large impact that we would associate with weak economy in mainland China. Up 100% year over year in iPhone sales in greater China. Launched new iPad last Friday. Sales did not benefit from new iPad in June quarter in mainland China. New portables that we announced at WWDC began to ship in China last week. June quarter sales did not benefit from these products. We remain really confident about our plans and are very excited about opportunity in China. Looking forward to incorporating more local services to China. Q: Thoughts on individual segments? A: iPhone, we expect year-over-year increase in sales in September. Same for iPad and Mac. Revenue guidance is up 20% year over year. Not expecting economies in Europe, Australia, Brazil or Canada to improve. No obvious evidence of economy impacting sales in China or the US. Reading same things that you are about these economies so we'll see. Weekly iPhone sales continue to be impacted by rumors and speculation regarding new products. In supply/demand balance. Don't expect new country or carrier additions in the quarter. Current iPad lineup includes $399 iPad 2, will impact ASP's in September quarter. US dollar has strengthened against most currencies. This should have adverse impact to revenue in these countries in excess of $400 million. Q: Can you walk us through some of the trends you saw for iPhone demand sequentially in other international regions? A: Completed iPhone rollout in all countries including China. Got the channel within target inventory range of 4-6 weeks by the end of March. Last quarter, increased sell-in over sell-through by 2.6 million units. Our sell-in was less than sell-through in this quarter. Net change in channel inventory across quarters was 3 million units. In different geographies, iPhone, US was very strong, running at 47%. Japan was strong at 45%. Greater China was up 66% but Mainland was up more than 100%. Europe did not perform well, essentially flat. Hampered our total results. Regarding general revenue, within Europe, we see marked difference between countries. UK was solid at 30% growth. France and Greece and Italy were particularly poor. Germany was a single digit positive growth. Eastern Europe was strong compared to Western, but Western drives revenue. Seeing a slowdown in revenue in that area. US and China are not seeing an obvious economic issue. Q: Mentioned "Fall transition" in the gross margin notes. What's that about? What would you get back in the December quarter? How much is short term? A: "Fall transition" that I spoke about is driving most of the decline that we see sequentially in gross margin. Not something that we're going to talk about in any level of detail today. We could not be more confident in our new product pipeline. A: There's a lot of speculation out there. It's difficult to sort out but I'm fairly convinced that there's an incredible anticipation out there for future products. As you would expect given what we've been able to deliver in the past. I think it's a reasonable amount. In terms of channel inventory for the current quarter, we put our thinking in the guidance that Peter gave you. Q: Talk about Mac business? Up 2% year over year -- how much was due to product transition or weak economy? A: Clear the PC market is weak. Frankly, we believe the primary factor for our lower growth rate in the Mac area is the timing of our portable announcement in the quarter. Less than 3 weeks remaining in the quarter. The year ago compare, we made a transition in the portable area in February. Sold our new lineup for the entire Q3 period. Prior to WWDC, our weekly Mac sales were running below the prior year. After WWDC, MacBook Pro and MacBook air drove year over year increases in weekly sell-through. They were to the level that got us back into overall positive territory and our 25th sequential quarter beating the PC market. Entered quarter in backlog on Retina MacBook Pro, anticipate doing so next month. For month of June, our portable share was at 25.5% and record 47% of revenue share in month of June. Would attribute a large amount to what has happened in terms of timing of our portable announcement. Q: What are your conversations with carriers in terms of pricing subsidies? A: Generally, I would say that our role is to make the very best smartphone in the world. That has an incredible user experience, far superior to everything else. At the end of the day, the carriers want to provide their customers with what their customers want to buy. The most important thing for us is to continue making the best products in the world. We are deeply committed to doing this and maniacally focused on it. The total subsidy that they pay is fairly small relative to the monthly payment they collect over a 24-month period. Many tell us that iPhone has several advantages to other smart phones. Churn rates are less. Shared data plans do well with iPhone customers, and are more likely to have a tablet. They value these customers quite a bit. Our engineering teams work with carriers to find the most efficiently ways to deal with data -- we feel that we are the most efficient smartphones on the market for those in an app-rich ecosystem. Will focus on making the best product and carriers will be very motivated to provide it to their customers. Q: You were above expectations relative to guidance on iPhone. Above on iPod. Said you were thrilled with iPad, but EPS came in 5-6% above guidance. Perhaps you can help us illustrate where you were disappointed on guidance? A: Given what's going on around us, we're happy with our quarter. Sales of each of our products did exceed what we factored into guidance. Especially true with iPad. Revenue grew by $6.5 billion year over year. Some things did impact us during the quarter. The economy in Europe is not doing well. Saw some economic impact in natural resource space economies, including Australia, Brazil and Canada. Reading same rumors and speculation that you are -- this caused a pause in some purchases. Delay in Ivy Bridge impacted sales in April and May. Saw large increase in Mac sales after WWDC. Did not get benefit of launching new iPad or new portables in China. Additional strengthening on the dollar. These impacted the quarter and we're very happy with how business is performing and excited with new product pipeline. Q: Talk a little about smartphone growth in emerging markets? Maybe 70% of smartphones in China and emerging countries are under $300 or $200. Do you agree with that market characterization? Does that limit your ability to gain share in a marketplace where 70% of the units are in a price point that you don't play in? At what point does that math prevent you from gaining share? A: The specific data you've quoted doesn't map to what I've seen. We've been very focused on China because we see it as an enormous opportunity for us. We're very pleased that we were able to grow our iPhone sales over 100% in mainland China last quarter. Firmly believe that people in emerging markets want great products just like in developed markets. We're going to stick to our knitting and make the best products. If we do that, we've got a very, very good business ahead of us. That's what we're doing. Q: The share objective in and of itself is not an explicit one? That's the consequence of making good products? Or is that an explicit objective? A: Across everything that we make, the goal is to make the very best product. That's more important and overshadows all over things. By doing that, we will have a great business. Our results today show that. Q: Is the channel inventory commentary all on a look-forward basis? A: The weeks that we quote are forward looking because inventory is in the channel for forward sales. Q: The comments about the iPad being just in target at 4-6 weeks would suggest a slowdown in sales. A: The channel inventory is only for the indirect channel. It is not used to support direct sales -- Apple Retail, Apple Online, Apple Education. I don't want to give you specific guidance on iPad sales but it's important to keep that in mind. That's the case with all products. I know that some companies refer to their channel inventory in terms of growth sales. We don't do that. Q: There is some higher quality competition for the iPad now. What do you think about pricing? A: iPad 2 did very well, new iPad is more popular now. iPad 2 did very well in K-12 area, sold about a million units for the quarter. We have been very aggressive in the space and that won't change. We've seen many different tablets come to market over the last year and I have yet to see any of them gain a level of traction. We have 225k apps optimized for iPad. Incredible experience on iPad. Most customers feel that they aren't looking for a tablet, they're looking for an iPad. We will keep innovating in the space and we will keep a very strong business going forward. It took us more than twice as long to sell this many iPads as iPods, and a third less time on iPad than iPhone. We feel very good about it. Q: Can you talk a little more about segments that have been driving iPad? A: Triple digit growth rates in many geographies. Generally speaking, international markets in aggregate are extremely strong -- in triple digits. US is a big lower, but important to keep in mind that the US is on a faster adoption curve with iPad. We're thrilled with numbers everywhere. Latin America is tripling. Growth out of countries that border on being shocking in terms of growth rate. We would not have dreamed of shipping 17 million last quarter so we feel very good about it. A: Sold 1.3 million last quarter, up more than 170% year over year. Brings fiscal year to 4 million units. This is pretty incredible. Still at a level that we would call a "hobby" -- continue to pull the string to see where it takes us. Not one to keep around projects that we don't believe in. Lot of people here that believe in Apple TV. Continue to invest. Q: Don't do hobbies to be hobbies -- do it to make something bigger? A: We do it because we think it'll lead us somewhere. We'll see. 4 million isn't a small number and there are a lot of believers in it. 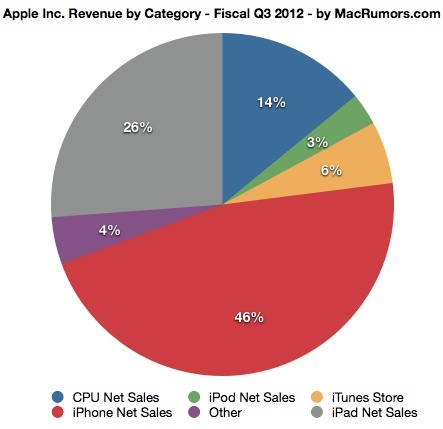 Q: iPad and iPhone ASP's seem to have declined more this quarter than previous quarters. What is this due to? A: Don't talk too much about ASP but, iPhone: down due to higher mix of lower price models and stronger US dollar. Sequentially and year over year. Regarding mix, believe this was driven by new product rumors, economic conditions especially in Europe, and a change in inventory by model. For iPad, it was down more year over year than sequentially. YoY decrease is attributable to higher mix of lower priced models, reduced price of iPad 2 to $399, expanded distribution with higher mix of indirect sales versus last year, and US dollar. Q: Talked about hobbies… look at Passbook -- is it possible that Apple will have a bigger role in a digital wallet? A: Passbook in general is a key feature -- all of us have found that we were getting many passes and tickets that were scattered all over the iPhone in different apps. Passbook does an incredible job of pulling all of those to one place. It's an important feature of iOS 6 and I wouldn't want to speculate about where it might take us. Q: Want to followup on pricing. Do you think the lower price point on iPad drove elasticity of demand for that product? Were sales higher or did customers migrate downmarket to lower priced products? A: We believed that the sales would be incrementally larger and that there was price elasticity and that there was a buyer that really wanted the best product that needed it to be a little less expensive. We saw that, it did help our sales, it particularly helps K-12. The adoption rate of iPad in education is something that I've never seen from any technology product in history. Usually education tends to be a conservative institution in terms of buying. We're not seeing that at all on iPad. It's been a big help for us and I'm glad we did it. Q: Ask about opportunity you see in India? What hasn't Apple been more successful in India? What's the strategy there? A: I love India. But, I believe that Apple has some higher potential in the intermediate term in some other countries. That doesn't mean we aren't putting emphasis in India -- we are. Our business there is growing. The multi-layer distribution there really adds to the cost of getting products to market. We're gonna continue putting some energies there but from my perspective, in the intermediate term there are larger opportunities outside of there. Q: Component availability, particularly new components? A: We factor supply into the guidance. Generally, we have been short of MacBook Pro with Retina Display. Ended quarter with backlog. Working really hard to deliver those to customers quickly. Will be in supply/demand balance. Won't talk about new products nor the parts in them -- a limit to what I can say there other than anything we know about we've included in the guidance. If we were short of something we'd be spending our energies on mitigating that. Q: In terms of the new iPad with Retina display, any constraints there? A: New iPad ended the quarter just over the 4-week line. That said, as a reminder, we did not ship the new iPad in China until the current quarter. We feel we ended Q3 in a balanced situation. Q: Building great products rather than aiming for a particular price point. Thoughts about that? A: Our "North Star" is to maniacally focus on making the world's best products. Economic turmoil may push us side-to-side but we will stay on that journey and focus on making the best products. We've seen it again and again throughout the years that during these types of periods is where we distance ourselves further from those that don't innovate. It increases the gap between us. That's what we focus on. When we can do that and hit more aggressive price points, I think you can see that with the $399 iPad a few months ago and the iPhone 3GS is free in the US and several other countries. There has been a lot knocked off that price. We will continue making the best products in the world. We aren't changing that. Q: When you think about how the iPhone has penetrated the planet, there's been a lot of rumors and speculation about future products. How do you manage iPhone transitions and carrier ramp? You're not launching any major carriers or countries but how do you manage that? A: Try very hard to keep our product roadmap secret and confidential. We go to extremes to do that. That, however, doesn't stop people from speculating or wondering and they'll never do that. The great thing about this country is that people can say what they think and so-forth. I'm not going to spend any energy trying to change that. I'm glad that people want the next thing. I'm super happy about it. There are obviously quite a few that want what we're doing now as well. I'm not going to put any energy into trying to get people to stop speculating. I don't think it would amount to anything. Apple missed their declared earnings they predicted. That's the story. I don't know MR chose not to report this. For the second fiscal quarter, Apple has issued guidance of $34 billion in revenue with profits of $8.68 per share. Actual results: $35 Billion and profit of $8.8 billion. Pretty much bang on, slightly exceeding guidance. Spinning a little, aren't you? Now, let's see. Analysts predicted Apple profits much more accurately than Apple did in all but two quarters in the last 10 years. Apple consistently underestimated them. Would you say that Apple guys are absolutely lousy at running their business? I'd say this profit miss explains why Apple wants so much money from Samsung. It's very unlikely they are going to get any though. Apple issue guidance at the start of the quarter with very little actual sales data. Analysts issue their guesses, oops sorry, predictions at the end of the quarter with considerable sales data. Hmm, can't imagine why Analyst numbers tend to be close to the actual results, nope, not even a little. Apple was right on the mark in their guidance for this quarter. I guess they're better at running the Apple business than analysts are at running their business. Now, tell me again. What do analysts do, and why should we care? Good thing they'll soon be able to add that $2.5B settlement from Samsung to the bottom line. They guided $8.68 per share on $34 billion and delivered $9.32 on $35 billion. Certainly not what people were hoping for, but they didn't miss their guidance. Macs are stagnant and will continue to be so as ultrabooks take off. You do realize the MacBook Air is what started the ultrabook craze, right? The only thing that Apple is truly dominant is tablets where they have no real competition as of yet. That will change with Windows 8. We also heard this about Zune and Honeycomb and Windows 7 tablets (HP Slate anyone?). Seems there's always someone who's going to eat Apple's lunch tomorrow. But always tomorrow.